Item # 301064 Stash Points: 499 (?) This is the number of points you get in The Zumiez Stash for purchasing this item. Stash points are redeemable for exclusive rewards only available to Zumiez Stash members. To redeem your points check out the rewards catalog on thestash.zumiez.com. Lost some screws? 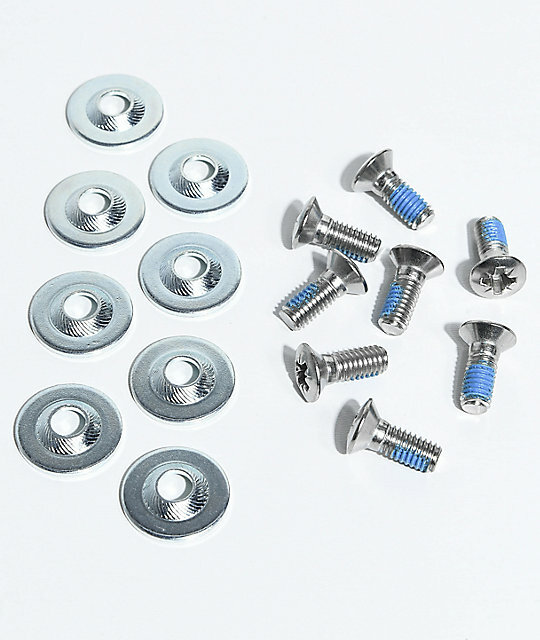 Or looking to replace some screws that have been stripped out? No problem! The Alibi snowboard mounting set has you covered with 8 screws and 8 washers in silver that are compatible with most bindings. Snowboard Base Screws from Alibi. Set of 8 screws and 8 washers.